And off we go... 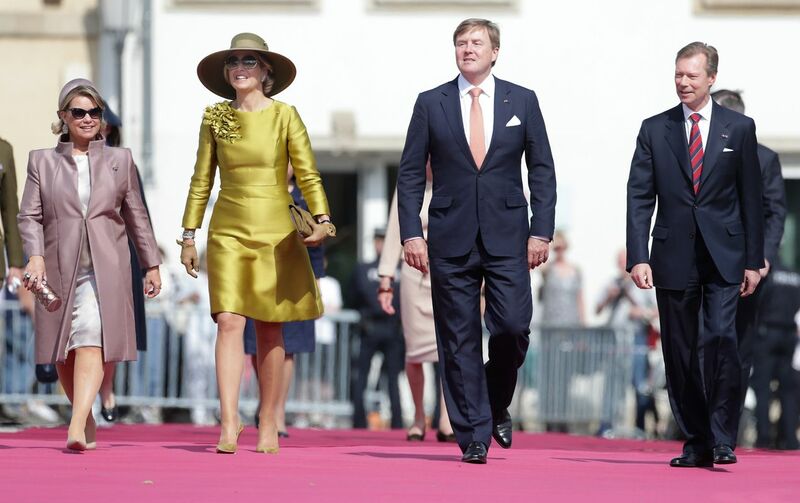 The other Nassaus arrived earlier today in Luxembourg for the long awaited three-day state visit to the Grand Duchy. It were the Hereditary Grand Duke and Hereditary Grand Duchess who first shook hands with and gave hugs to King Willem-Alexander and Queen Máxima of the Netherlands upon their arrival at Findel Airport. 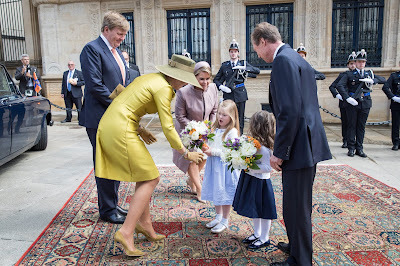 The Dutch royals than made their way to the palais-grand ducal where the official welcome by Grand Duke Henri and Grand Duchess Maria Teresa, including military honours, national anthems, a review of troops and a presentation of the respective delegations, took place. The royal foursome then entered the palais for some private talks, where Hereditary Grand Duke Guillaume and Hereditary Grand Duchess Stéphanie joined them once again. Check out our Facebook page for a video of the arrivals. After private talks at the palais, the Dutch guests paid a visit to the Monument National de la Solidarité Luxembourgeoise on the Kanounenhiwwel to lay wreaths and pay their respects in the presence of the Prime Minister and Minister of State, Xavier Bettel, and the Chief of Staff of the Army, General Alain Duschène. 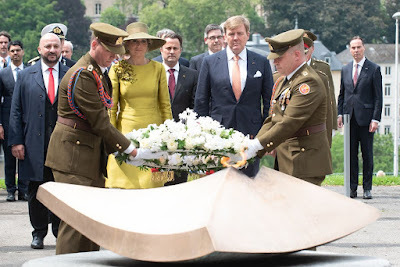 At the monument the King and Queen also met the flag bearers, members of the Committee for the Remembrance of the Second World War as well as representatives of patriotic associations. 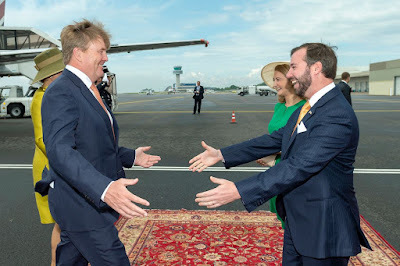 Back at the palais, King Willem-Alexander and Queen Máxima joined Grand Duke Henri and Grand Duchess Maria Teresa as well as Hereditary Grand Duke Guillaume and Hereditary Grand Duchess Stéphanie for a private luncheon. 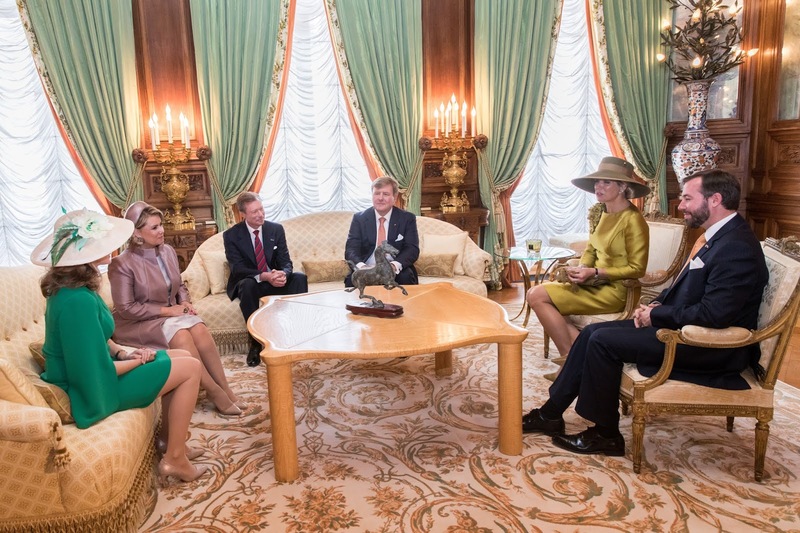 The Dutch head of state and his wife then met with the President of the Chamber of Deputies, Mars Di Bartolomeo, Prime Minister Xavier Bettel and Foreign Minister Jean Asselborn. And about now preparations for the best part of any state visit (at least for shallow me) probably are in full swing: the state banquet. Let's keep our fingers crossed that there will be some major tiaras. (Still sulky about that state visit to France.) In any case, there will be an extra post about the banquet coming up once pictures are available. In the meantime, more pictures and videos can be found at Wort, RTL #1, RTL #2, the cour, Tageblatt and probably beyond that and all over the Dutch media.